Toddlers or kids will get the suave and pretty look when they wear most glamorous suit that has exotic embellishments and lapel. Parent should choose best suit kids that have supreme designs and colors. Cute children those who have natural fashion instincts will look gorgeous and stylish when they wear black colored long sleeve suit which has mandarin color and black colored pant. Add value to the suit by pairing it with spectacular accessories like black leather shoes, bow tie and white shirt. Toddlers will be mesmerized when they wear rich suits that have glittery features. Even though there are lots of dresses for kids like shirts, trousers, pants and shorts nothing will look as pretty as suits that have superior embellishments. Children will be interested to wear colorful suits during important occasions like birthday bashes, wedding ceremonies and evening parties. They will look showy and beautiful when they enter the event along with their parents. If you want to put your child in the limelight in the upcoming function the best choice will be bespoke or readymade suit. Since ultra modern suit is considered as versatile clothing the toddler or children can wear it on all the occasions whether it is going to be formal or informal. It is worth to note that suits will blend in the children body wonderfully and will improve their style. Since it comes with classic stitching and very rich fabric suit will improve the silhouette of the child. They will carry innocent and carefree look when they wear kid suit that has spectacular ingredients. 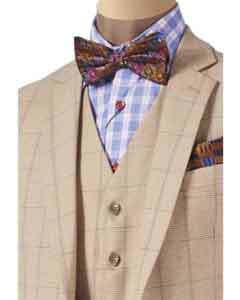 The wearer will be a show-stopper and will be flanked by other kids when they wear most modern suit. Suits for children come in different designs like striped, linen, silvery and plain clothing. If it is going to be a celebration time like Christmas, Wedding, New Year or other such important functions suit should be for the first choice for the new born kids. There are two-piece and three-piece suit for kids that comes in natural colors and design. Kids will be ready for photo shoots when they wear the suit that has sophisticated ingredients. Children those who love socializing in the famous social websites will be able to generate thousands of likes when they wear colorful suit. •	Mod suit for toddler: This extraordinary suit has two-button, chest pocket and fully lined jacket. This will be a perfect fit for the wedding function. •	Bear leader suit: The material used in this suit is modal and it has other special features like turn-down collar, covered button and solid color. Kids will look handsome and cute when they wear this dress for the birthday. •	Ring bearer suit: Kids will get the rich man's look when they wear this suit which has bow-tie, suspender and hat.